Settle Tourist Information Centre Ltd.
31st Oct to 4th April 10.00 - 2.30. Closed on Xmas Day, Boxing Day and New Years Day. UKs finest Bed and Breakfast resources for Walking Rambling and Hill Bagging. Some handy addresses and numbers to try if doing the three peaks challenge. These resources are provided for the benefit of our website visitors, and are not necessarily endorsed by us. Any advertising or promotional text has been provided to us by the named organisation, or has been taken directly from their own website. Any times or information shown was correct at the time of publishing, but may have changed since. You are therefore advised in ALL cases to contact the organisation prior to visiting etc. Thinking of doing the walk, but not sure about the ups and downs. It’s often easy to take the wrong route and end up in boggy grassland. Well sit back and take the easy route as Gerard Mitchell guides you through a ‘Virtual Walk’ around, up, and over the three peaks. The Three Peaks Challenge Walk. 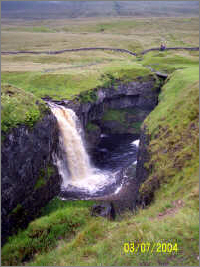 This narrative should be used as pre-amble through the walk and should not be considered as an alternative to a recognised leisure map of this area of the Yorkshire Dales. Arriving in Horton-In-Ribblesdale from Settle there is a decent sized car park on the left 100 metres after the Pen-y-Ghent Café. All day parking costs around four pounds which should be considered reasonable when toilet facilities are included. road and immediately before the churchyard take the signposted path on the left through the wooden gate and cross the field. At the opposite end of the field go through the gate onto the narrow road, turn left and cross the footbridge, then left onto the minor road to the hamlet of Brackenbottom. When you reach Brackenbottom look for the signpost on the left and cross the stile into the fields. Follow a very distinct path uphill and over a series of crossing points and gates and then, if the visibility is good, a very distinct target can be seen, the southern end of Pen-y-Ghent. assault of the first summit looms to your left. Fifteen minutes hard work should see you up the stone steps, through the steep boulder field and following the wall on your left up the gentle last three hundred metres to the trig point and shelter at 695 metres. Once you reach the summit don't forget to slap the top of the trig point. Why people wish to do this is unknown, but for some strange reason most walkers seem happy to join in. Climbing over the wall the path now starts a gentle descent before turning along the western edge and descending further along another very distinct but rough track. 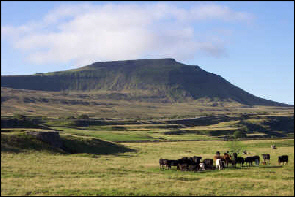 Ingleborough. If you are of a nervous disposition don't look; it might just spoil your day. At the obvious hairpin bend, with a rock face thirty metres to your right, bear left and continue down the distinct path falling away down the hillside to your left. As you descend you can see in the bottom of the valley the large natural hollow in the ground that is Hull Pot. Continue down the Pennine Way to the bottom of this valley and the gate on the left and the sign indicating left to Horton but right to Foxup. Turn right for about two hundred and fifty metres and Hull Pot appears on your left. Following wet weather the usually dry riverbed of Hull Pot Beck creates a spectacular waterfall crashing into the pot bottom. With the pot to your right, continue up the gentle slope and follow the in-distinct Miners Path north-west and cross the Pennine Way at the in-appropriately named Dismal Hill. This route, although not perfect footing, avoids the necessity of crossing the quagmire of Black Dub Moss. From the T junction head for the viaduct but don't go under it. Keep to the east side and climb up the side of the embankment at the northern end joining a track from the right. This will take you past Bleamoor Sidings and signal box and on to Blue Clay Ridge. 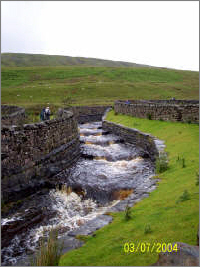 The path, which is running adjacent to an aqueduct, now crosses the railway and starts the ascent of Whernside. After crossing the stile with the waterfall of Force Gill to your left the path goes north north west up Slack Hill for four hundred metres but watch for the signpost indicating Whernside and the stile taking you left over the wire fence towards the summit. Continue forward, with the summit now in front, until you reach the solid stone path through the marshy area called Greenset Moss then the left bearing steep climb. highest point in Lancashire. Looking further west on a clear day you can easily pick out Morecambe Bay. Continue down the spine of Whernside for just over 1km before turning left to steep descend into the valley below, again along a well defined path that turns into a farm track. the road there is a decent pub at Chapel-le-Dale called the Old Hill Inn. Turn left and just beyond the pub turn right taking the path onto and through the limestone pavements of Highwood Pasture. This is a gentle introduction to Ingleborough and behind you, back across the Whernside side of the valley, you will see some of the finest limestone landscapes England can offer. The once heavy slog over Humphrey Bottom has been improved by the laying of wooden duckboards and a good solid stone path. At the end of Humphrey Bottom is the short but very steep zig-zagging section known as 'The Wall'. Push on up until you come to a delightful spring at the top, and then turn right up a slightly more gradual climb onto the Ingleborough plateau. Head for the western end and the last trig of all... Ingleborough at 723m. From the trig point return back to the point you entered the plateau, back twenty metres down the rock then take the distinct path to your right heading due east and traversing the south-western flank of Simon Fell back towards Horton. indicating 1.5 miles back to Horton. This should be treated with caution! The popular census of opinion amongst the regular walkers is that the distance is still in the region of 2.25 miles. This might not sound like a real issue until you already have twenty four miles behind you. Notwithstanding this, press on through Sulber Nick and passing Sulber Nick towards the gap on the horizon before descending into open grassland and a final hillock to the picturesque railway station in Horton. Continue down to the main road and to the bend where it crosses the bridge over the river and you will see the Crown Hotel which is on your left. Home at last! 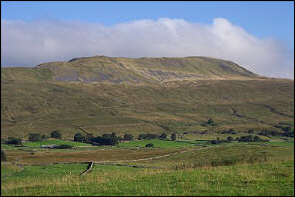 The Yorkshire Three Peaks Challenge Walk traditionally starts and finishes at the Pen-y-ghent Cafe situated in the tiny village of Horton-in-Ribblesdale, near Settle in North Yorkshire. 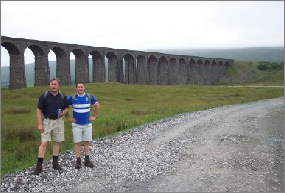 The Yorkshire Three Peaks Challenge Walk is a tough and grueling high mountain walk over a variety of rugged terrains and should not be underestimated. Whilst the walking is generally pretty good it is a long event for a single day's hike and includes three big climbs. 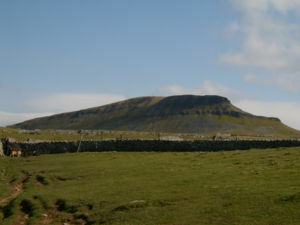 The total ascent is 1586m (5202ft) with the last climb up onto Ingleborough when the legs are tired and the spirit is being gradually weakened being particularly steep. Traditionally the grueling walk should be completed within 12 hours, though the actual time taken will vary depending on age and stamina of the individual, and also the prevailing weather conditions. The average time over the course by our walkers is between 9-9.5 hours with the fastest time being around the 7 hours. A welcome call in at the Crown Hotel in Horton In Ribblesdale. Hopefully if the weather is good enough you can sit in the beer garden to the rear of the pub. If not there is a larger room to the left as you enter the pub through the front door. Horton in Ribblesdale lies north of Settle on the B6479. There is a reasonably large car park in the centre of the village. There are various Bed and Breakfast accommodations in the village along with a large flat campsite at Holme Farm within 200m of the start point. Horton in Ribblesdale Railway Station is on the Leeds - Settle - Carlisle line and has a regular (albeit usually 2 hourly) train service. The train times vary and you should call National Rail Enquiries on 08457 484950 for the latest information. 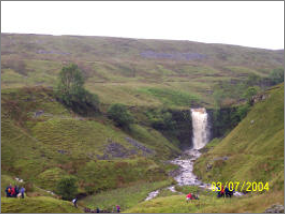 Sadly, we no longer organise a Three Peaks Challenge Walk, and this page is retained on our website for the benefit of visitors to the site who may be interested in doing the walk for the first time. Each year July sees the annual running of the Three Peaks fell race. Make sure you take time to read the plaque on the wall displaying each year's winners and winning times. Be assured... you will be staggered by the fastest time to date. 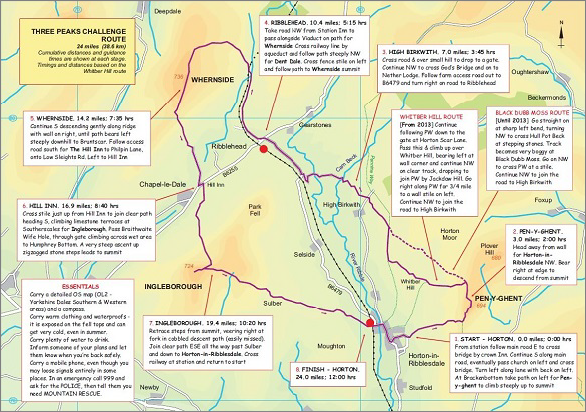 The image below is a detailed map of the three peaks route showing cumulative distances and guidance times for each stage. (timings and distances are based on the Whitber Hill route). The image is taken from an excellent information site which gives other details about the three peaks challenge walk, and also provides a smartphone app for the three peaks area, including the challenge walk route. Go to www.skyware.co.uk.